On Thursday at 12:45 PM GMT the European Central Bank (ECB) will publish its first monetary policy statement since the EU referendum in late June. Will it respond by unleashing more stimulus in the markets? Or will it pull a BOE and adopt a wait-and-see mode? 1. Draghi was a bit dovish last month. 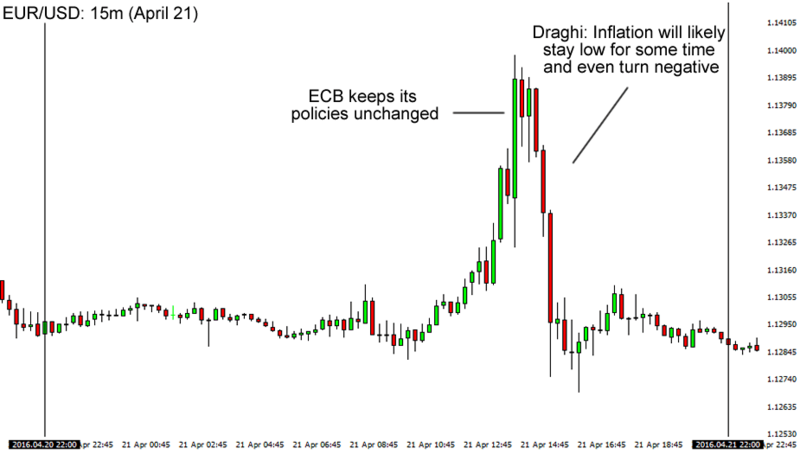 In early June the ECB decided to keep its policies steady for another month. The party didn’t start till ECB Governor Mario Draghi walked in though! In his presser, he surprised the markets by admitting that the risks to the euro zone’s growth are tilted to the downside, and that inflation will likely remain low in the next months. Heck, he even warned that a weaker domestic consumption could drag Q2 2016’s growth figures! Draghi didn’t talk about Brexit much, just saying that the event poses a growth risk to the euro zone and that it’s difficult to foresee its impact on the markets and the euro economies. But, he also reassured that the ECB is “ready for all contingencies” following the event. Mark Carney, is that you? Much like last month, market players aren’t expecting any changes from the central bank in July. After all, the ECB just adopted a negative interest rate policy in March and launched its TLTRO II program on June 8. Many believe that the ECB can afford to wait, not only for the impact of Brexit on the euro zone economy to materialize, but also for its previous policy changes to take effect. Instead, Draghi is expected to repeat his calls for more fiscal efforts from the euro zone economies. See, the ECB head honcho has been calling for local governments to step up their spending and implement reforms to help boost their respective economies. The calls have fallen on deaf ears though, with Germany, the only country with significant firepower, reluctant to give up its budget surplus, and countries like Portugal and Spain getting sanctioned for failing to reign in their massive budget deficits. Italy’s bank crisis is also expected to pop out during event, where Draghi will likely try (and fail) to reassure the markets that the Italian banks could still deal with 360B EUR worth of bad loans. Good luck with that! Finally, analysts are expecting Draghi to talk QE. More specifically, they believe that the ECB’s top boss will try to rename/restructure/adjust its technical definition so that the program could include more bonds (ex. German bonds) to ease concerns that it’s running out of top-grade bonds to buy. Much like the RBA and the BOE, the ECB is likely to keep its cards close until it sees more data taken after the EU referendum. In fact, we probably won’t see any changes until the ECB sees the revised staff projections out in September! Other market surveys also show that, if not September, then the ECB will likely adjust its policies some time near the end of the year. 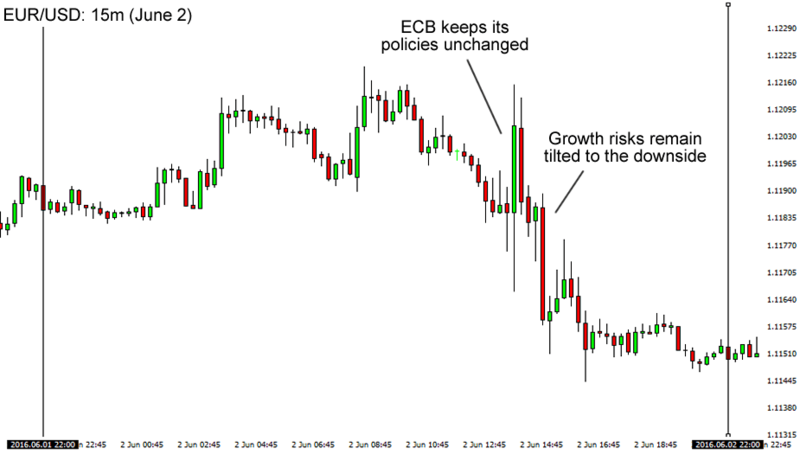 Back in April, EUR/USD shot up from its intraday lows to new intraday highs almost 100 pips away when the ECB surprisingly kept its policies steady. The pair erased all of its intraday gains though, when Draghi hinted that inflation is likely to stay low for some time and might even turn negative. Can you spell recession? Last month’s price action painted a different picture. We saw EUR/USD spike in both directions before settling on an intraday downtrend after Draghi talked about Brexit and the euro zone’s downside risks to growth. What do you think? Will we see more easing from the ECB this month? Or will it pull an RBA and BOE and wait for more data before making any changes?